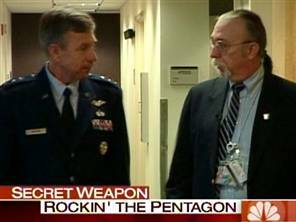 It was an especially happy morning for the Rock Snob brain trust, for the Today show unexpectedly ran a long segment on Snob mascot and recurring Yacht Rock character Jeff “Skunk” Baxter–who, as anyone who has read page 9 of our book is aware, is not only an ace session guitarist and ex-Doobie Brother but an adviser to the Pentagon on ballistic missile defense! Click here to see the Today report and the sight of the Skunk in a suit and tie. End-of-year tradition (and, to be honest, pressing deadlines on work assignments) dictates that, in lieu of new posts, we offer you this round-up of Snobsite’s finest moments over the course of 2005, its inaugural year. The headline above, as any Rock Snob worth his salt knows, is an allusion to the curious title of Jethro Tull’s first greatest hits album (cover below). If some Snob out there has any idea what “M.U.” stands for, let us know. To see Steven and David’s “Honest” and “Rock Snob” lists of their Desert Island Discs, click here. To see Steven and David confess their non-Snob-music guilty pleasures, click here. To see Al Jaffee’s “Snobby Answers to Loser Questions,” click here. To download a podcast of Steven and David’s appearance on WNYC’s “Soundcheck” program, click here. To hear Meredith Ochs’s essay about Rock Snobbery on NPR, click here. To read our infamous VH1 parody, “I Love the Aughties,” click here. We hope you enjoy this round-up, and keep an eye out in January for the new branch of this site devoted to The Film Snob*s Dictionary. Sounds like a capital idea, this test, but why not ask this site’s very smart readership if they can help out! “Chad lives,” anyone?